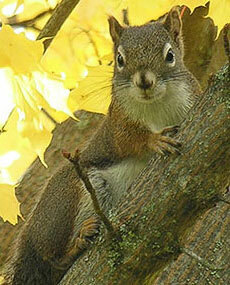 The Red Squirrel is a tree squirrel. Some people think of mice and rats when the word, rodent, is used. True, they are rodents, but so are marmots, squirrels, chipmunks, porcupines, and beavers. Indeed, in terms of numbers of species and numbers of individuals, rodents are the most successful mammals in around the Lake (and British Columbia). One might think that, as there are so many of them, this section would be filled with pictures of various species. Alas, not all are as easy to find as the very active and chatty Red Squirrel. Others don't always show themselves: some are secretive, some nocturnal, and some stick to high altitudes. However, this selection is growing.